Since then I’ve become a bit of a sleeping bag geek. I studied specifications, slept in bags that said they would be comfortable at -5 in which I shivered at +5 degrees. I’ve learnt how to make the most of shoulder baffles and drawstring toggles and to this day still struggle to use a pillow effectively in cold weather – a camping pillow that is. I’ve learnt that what you wear in your sleeping bag can make a big difference to a night’s sleep. I’ve camped next to my car in mid-summer which means you can have your big pillow from home, a generous inflatable airbed and not have to worry about keeping warm in the night, you may even have to unzip your sleeping bag because you get too hot! Camping in other seasons can be a bit less predictable and if you are travelling light you will have to plan ahead and make sure you have the right sleeping bag (and other kit) for the expected conditions. It is always better to plan to be if anything too warm because you don’t want to be in a position where you are too cold and from experience I can tell you that the specification on sleeping bags is only an guide as to what temperatures they are designed for. Some people get cold feet at night – even under the quilt at home – so a hot water bottle can be useful for comfort and also consider some light exercises before you get in your sleeping bag to generate some body heat. Thick socks and a woolly hat are essential on all but the warmest nights. Although this article is titled ‘Sleeping Bags’ the term ‘Sleep System’ covers more broadly the other elements that together allow for a good night’s sleep. The main components are the insulation under your sleeping bag (airbed, roll mat etc.) and the insulation worn as clothing. You may also choose to use a sleeping bag liner (easy to wash and adds some insulation) or a bivvy bag waterproof outer cover, which again adds some insulation. The two main types of filling that sleeping bags are made from are man-made (eg. polyester) and down (duck/goose feathers). Down bags are excellent insulators that pack down small and light but don’t perform well when wet and should be stored hung up. Man-made material bags are usually lower in price, can be stored all year round in their stuff sack and maintain their insulation properties when wet. But for a comfortable night’s sleep you want to make sure your tent has plenty of ventilation to prevent a build-up of condensation. If necessary bags should be hung out to air during the day if camping for more than a couple of nights. 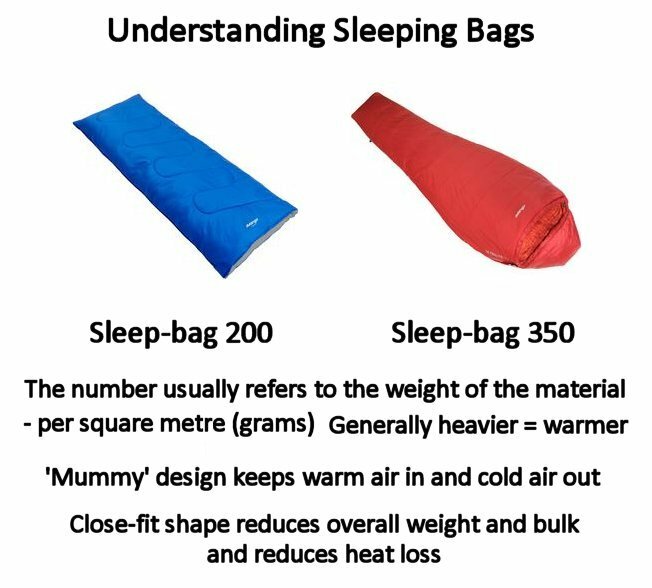 Both type of sleeping bags come in different fill weights so you can get a lightweight down bag meant for summer use or a man-made filling bag designed for winter use – which would be much bigger and heavier. The shape of the bag can also make a difference to the size, weight and insulation properties. The mummy style bag is more efficient at keeping heat in and less heavy/bulky than a rectangular bag.